Arrow’s last episode was lackluster, but “Haunted” more than makes up for it. This episode offers up one delight after another. John Constantine brings the magic—quite literally. But he’s still only the second best character this episode. First, good on Alex in spotting that Ollie is totally a Kennedy. (Which makes Moira into Joe Kennedy, which makes perfect sense.) Secondly, good on him for ordering Ollie to distance himself from Laurel. This is what kicks the Queen contrariness into gear. This scene was great for three reasons. The first was the assault, which involved the two “attackers” gently pushing their “victim” against a wall like they’re going to check her for scoliosis, and then kind of bouncing their shoulders against her while keeping their hands scrupulously away from any female body part that could possibly pleasure a pervert’s fingers. I’ve seen more indecent waltzes. And then Sara comes off the side of a building like a goddamn spider and stabs the hell out of the guys. Finally, when the poor woman starts thanking Sara—Sara chokes her. It seems that Sara’s been killing a bunch of criminals and attacking, but not killing, a bunch of women. She’s been doing it because she’s looking for Thea, her original killer. Oliver realizes this before Laurel does, and that’s a good thing because . . . This episode is filled with the kind of Laurel moments I was convinced, in past seasons, we could never have. The once fanatically loyal daughter is now utterly unrepentant that she neglected to tell her father that her sister’s reanimated corpse has escaped from her basement. The woman who demanded that no one ever go outside the law is now wearing a mask, choking her rampaging sister, and scolding, “You have got to stop this!” And the woman who once told Ollie to stay away from her is now shrieking about how Ollie doesn’t love her family enough. Laurel! He banged fifty percent of your family! I’m willing to bet that he will bag your mom before this series ends. (Arrow Writers: Please do this. Doesn’t Alex Kingston deserve a fun day after all that hard work she did on Doctor Who?) How much more can he love your family? The man can hardly stay hydrated as it is! Meanwhile, Darhk gave Quentin a computer virus that will selectively erase files. It needs to be activated in a federal facility, and the person who will help Quentin get into that facility is Dig. What to say about the scenes with Dig and Quentin? No raised voices. No big displays. But in their conversations you get the sense that the grown ups are finally home. Nobody is pining for their true love or agonizing over their souls. They get things out in the open and get things done. And if getting things done involves Quentin clubbing Dig over the head as a cover, then that’s fine. The virus nearly erases Dig’s brother’s file. Quentin salvages it from Damien Darhk. But what secrets does it contain? Darhk himself implies that Andrew Diggle was not the sterling officer Dig believed him to be and a look at Dig’s face when he reads the report shows that that’s true. The Arrow team finally captures Sara. (After Laurel nearly shoots her because of course Laurel would do that! She’s Laurel.) Sara has no soul. Ollie knows the guy who can get it back. In swaggers John Constantine with an unpressed shirt and what, to my ignorant American ears, sounds like a Scottish accent. 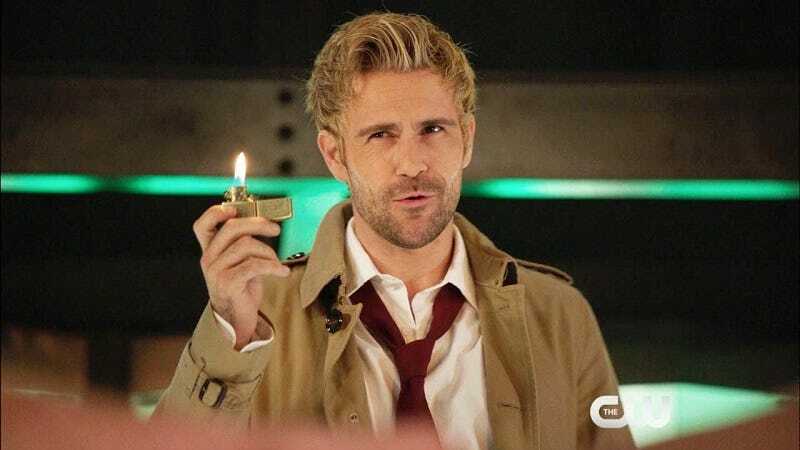 Constantine’s simultaneously in the current storyline and the flashback. It’s tough to say which he’s better in. Clearly, the flashback needed him more. It takes him all of ten seconds to commandeer the drug camp and kidnap Ollie to help him find a mystical artifact. The mystical treasure hunt injects some much-needed Indiana Jonesing to a tired aspect of the Arrow universe, with ancient caves and equally ancient booby traps. Constantine even finds a way to explain why so many awful things happen on Lian Yu—it’s a bad place that attracts bad people. I guess Alex Davis was right, it is Chappaquiddick. At the end, Constantine gives Ollie his version of a tramp stamp—a tattoo up the side of his torso. When the time comes, says Constantine, Ollie will know how to use it. In the present storyline, he not only subtly hits on all the Arrow women, he gives us the priceless gift of seeing Quentin Lance, Beat Cop, at a soul-retrieval-ceremony. I don’t know what I like best about this. First I like that in the soul purgatory world that Laurel, Ollie, and John go to, Laurel runs out of frame—only to run right back in from the other side like an old Nintendo character. And then tries it again, because she has less ability to use logic than an old Nintendo character. I also like that Sara is trapped in a Lazarus pit and Ollie and Laurel have to get her out together, like a mystical team-building exercise. And I like that getting a woman’s soul back from the underworld takes less than two minutes. Why drag it out? At the end, Ray’s alive and has gotten a signal to Felicity, Thea comes clean about her bloodlust, and Ollie refuses to distance himself from the Lance family.